A few years ago, I watched an episode of America's Test Kitchen that gave me a recipe for cooking sweet potatoes which I've used ever since, producing the kind of dish people rave about. I'm sharing it on here. I won't be giving exact quantities because it's the technique that works, not amounts. This will NOT involve marshmallows, by the way, if you're from that school of sweet potato eaterology. Note: Most of what we call "yams" in this country are another variety of sweet potato. Real yams don't show up in our supermarkets and are not as nutritious as sweet potatoes anyhow. Use at least one large sweet potato per person who will be eating. Peel or don't peel, depending on your preference. Cut them into thin uniform slices. Place them in a saucepan with a lid, along with at least half an inch of half and half, cream, or milk to cover the bottom of the pan. Add butter to your preference. (Note: I always use unsalted butter, not just for baking -- control of salt is important to good cooking.) Turn the heat on low and allow them to simmer for a long time -- the sweet potatoes will release their liquid, and that combined with the milk will steam them, but they'll take in flavor as they lose moisture. If you are the type to add sweetening, add it now -- brown sugar, maple syrup or molasses. Plus a dash of vanilla, if you want. After at least half an hour, check the potatoes, and add more liquid to keep the bottom of the pan covered. When they are completely tender, add salt, pepper and other spices to taste, plus more butter if you want. Mash them. They'll be unbelievably creamy, full of flavor, and have retained all their excellent nutrition. You can make these in advance and refrigerate them. 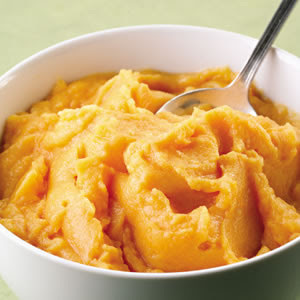 A trick I learned from cooking with Julia and Jacques is to keep mashed potatoes (and sweet potatoes) tasting "fresh" and non-oxidized when made in advance of a meal, hold back a little on the milk or cream you add when you mash them. Spread them in a deep bowl and pour a thin layer of milk on the top, enough to cover all the exposed potatoes. Cover and refrigerate up to a day in advance. When it's time to serve, mash the milk back into the potatoes and warm them in the microwave. You'll be surprised at the retention of flavor. One year my partner and I hosted a potluck Thanksgiving where we demanded that our guests bring dishes using only foods native to the New World. Turkey, pumpkin, cranberries and corn were easy choices. However, grains, eggs and milk necessary for some dishes proved problematic. We bought a few Native American cookbooks and spent several days experimenting. We discovered that filberts ground into meal and then boiled produced a nutty "cream" that was heavenly when used in place of milk. We allowed wild rice, sunflower and corn oil, manioc flour, and duck eggs (the latter was stretching it a bit). The resultant menu was staggeringly good. It's impossible to imagine world cuisine without maize, tomatoes, potatoes, chocolate, and the wide variety of beans and spices which have fed the globe for centuries now. Here's a list of crops given to the rest of the world by the Americas. Feel free to use this thread to share tried-and-true Thanksgiving recipes, your planned menu, etc. Are you of the stuffing-in-the-bird school or stuffing in a separate pan? Do you brine your turkey? Here's my planned line-up: Brisket (much preferred by me to turkey), sweet potatoes as above, cornbread stuffing outside the bird with hazelnuts and blueberries, whole-wheat rolls, green bean casserole, spinach, and peach cobbler (I prefer pumpkin as a vegetable).